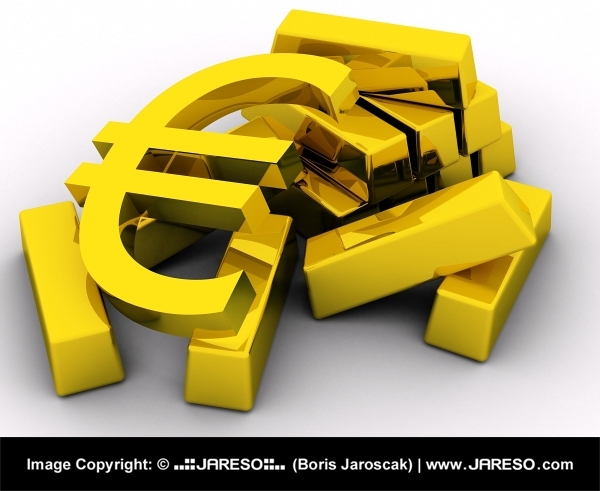 The Euro symbol sits with pride on top of a good handful of golden blocks. 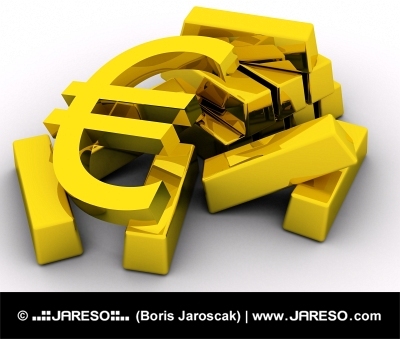 The Euro symbol is not sitting completely flat on top of the blocks due to the fact that it is on an unleveled surface of gold bars which are stacked randomly, not in any particular order. In fact, the top part of the Euro sign is elevated slightly higher from the bottom part of the symbol because there is a higher stack of blocks supporting it. The bottom of the Euro symbol is only supported by two golden bars that are adjacent from each other holding up each end of the symbol.